type (int) – type of the input value. store_key (string) – key to restore the last of the values entered. The format used to display the time/date of the date time edit. 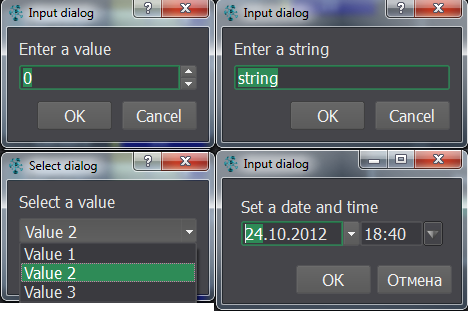 Applicable for the cerebro.gui.InputDialog.TYPE_DATETIME type only. True, if user entered a value and pressed “Ok” button. list of items to select from. Applicable for the cerebro.gui.InputDialog.TYPE_COMBOBOX type only. Applicable for the cerebro.gui.InputDialog.TYPE_FLOAT and cerebro.gui.InputDialog.TYPE_INT types only. format (string) – The format used to display the time/date of the date time edit. Sets the format used to display the time/date as a string. items (list(string,)) – list of items to select from. Sets list of items to select from. min – minimal input value. max – maximal input value. Sets minimal and maximal input values. Sets value in input dialog. Type of input argument is defined by type of input dialog.